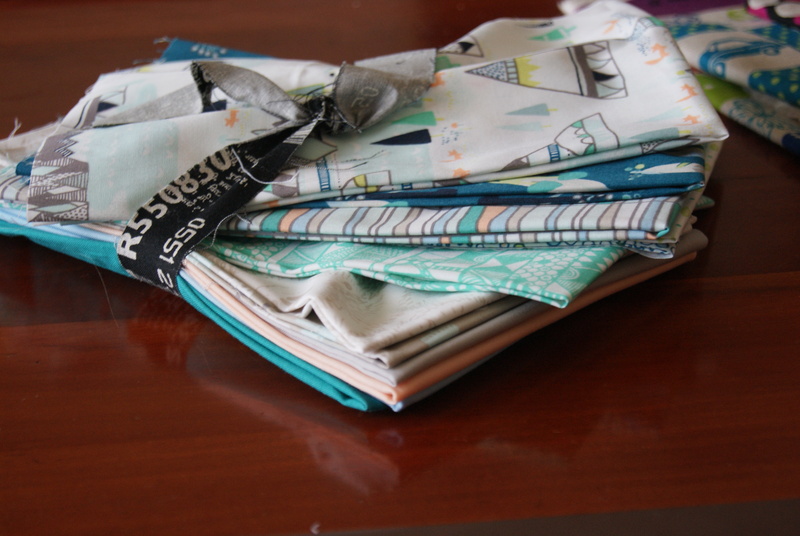 It’s a few prints from the lovely Indian Summer for Art Gallery Fabrics by Sarah Watson, donated to our guild for charity quilting by the designer herself, plus some pitch-perfect solids chosen and donated by Peg @ Sew Fresh Fabrics. And here is where we apologize to Sarah Watson, because this is an incredibly inadequate iPhone snap of her gorgeous materials. (You can also see that I sew at our small dining table–Janome and “Cinderella mat” coexist in a fragile peace.) In the center, I did three Oh, Fransson! 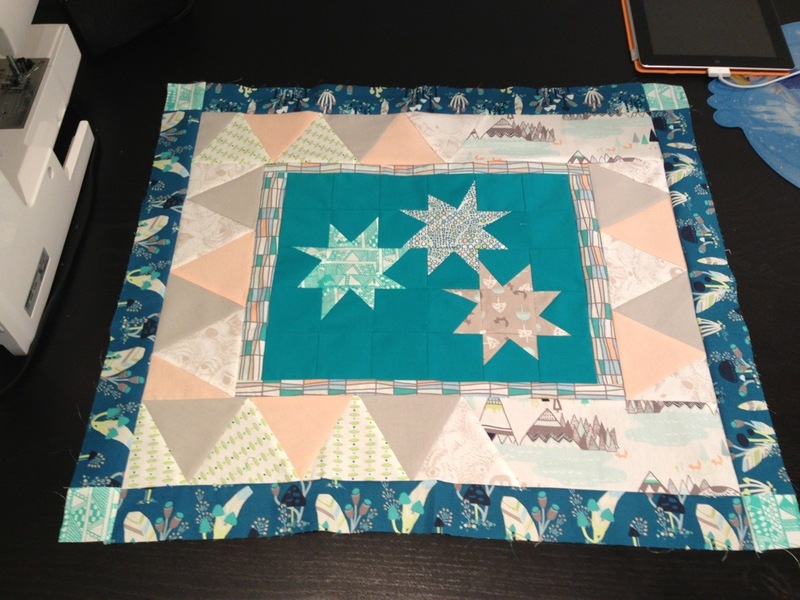 interlocking sparkle punch stars, but with 2.5” squares instead of her tutorial’s 3.5” squares. And then, I borrowed the tent-mountain-tree motif of one of the prints and did an equilateral triangle border. I took a glance at this tutorial at about dot com about rocking your plain old straight rotary ruler back and forth to cut equilateral triangles. Guys, it’s so easy, that I didn’t even screw it up the first time I cut. I’m no longer afraid of 60-degree triangles, so watch out, world. And mostly, I kept my points intact too, when I sewed them up, so yay. I took one more naptime-sewing session and finished up my part this past Monday. There are feathers in the dark teal print I used as a border, and, of course, that calls for some Anna Maria Horner Feathers. I spent an entire three-hour nap cutting and piecing these two darling feathers. I don’t think the feather-making process is usually this difficult, but I was trying so hard to conserve fabric that I did some little funky things–see the top left side of the vertical feather, for example. And then I rushed the whole bundle, top, fabrics, and all, five towns north of me, without ever getting out my real camera once. 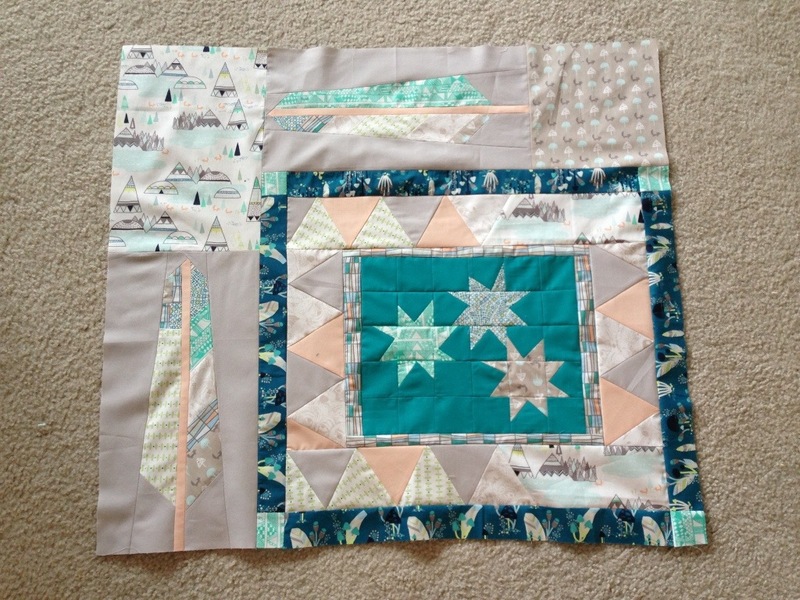 Here’s hoping I will have real photos to share of a finished baby quilt. I can’t wait to see what the rest of my team does with this bundle!